Have a question about Assistive Technology? By providing tips and strategies, the AT Helpdesk is here to support you in using your Assistive Technology to its full potential. 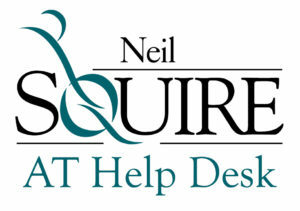 The AT HelpDesk was launched in 2010 by the Neil Squire Society, in collaboration with Post-Secondary Education, Training, and Labour in order to support New Brunswickers with Assistive Technology (AT) questions. The service is designed to help you access the most up-to-date AT information without having to do the work. The goal is to help reduce the employment gap for persons with disabilities by providing easy access to vendor-neutral, current information about AT solutions for education and/or employment. Launched in 2017, the AT HelpDesk website expands the AT HelpDesk services from taking calls, emails and text to include a website with plans to provide more opportunities to learn, share and collaborate around AT.